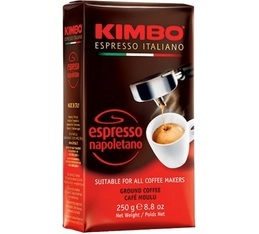 MaxiCoffee selected the biggest brands of coffee beans to guarantee a unique coffee: Illy, Pellini, Mokador Castellari, Caffè Vergnano, Delta Cafés as well as others. Organic coffee, decaffeinated coffee, flavoured coffee... there's something for everyone. We also offer freshly roasted and ground coffees by the best artisan roasters including Cafés Lugat : coffees roasted and ground artisanally by us. 4 Artisanally roasted coffees for coffee lovers! Enjoy this 100% Arabica organic ground coffee by Destination, suitable for use in filter coffee machines. Packaging: 1kg. Le Classico de Caffè Corsini is a 100% Arabica ground coffee roasted Italian style for a full-bodied espresso with a beautiful creamy taste. This organic ground Buffalo Soldier coffee by Marley Coffee is a blend of full-bodied Arabicas with hints of dark chocolate. It comes in a 227g packet. 100% Arabica ground coffee from Caffè Vergnano for a perfect espresso with your manual espresso machine. Box of 250g.